We have been using a relatively new assay from a company called Genomind (the Genecept test) in some of our patients with bipolar and/or depression. The test involves a saliva sample which is analyzed for ten gene variants that may be useful in guiding treatment. So far we find that in about half of the patients with treatment resistant depression and/or bipolar the test is helpful – whether by suggesting modifications in dosing or by suggesting specific medications that may be useful or which should probably be avoided. Serotonin Transporter (SLC6A4). This gene codes for the protein that removes serotonin from the nerve junction after it is released. The serotonin reuptake inhibitors (SSRI’s) (antidepressants like fluoxetine (Prozac) or sertraline (Zoloft)) act on this transporter. There is very good science linking variants in this transporter to increased risk of depression and/or anxiety conditions. In addition, certain variants may suggest that a person is less likely to respond to SSRI’s. Gated Calcium Channel. Associated with risk of several psychiatric conditions. Ankyrin G. Also associated with several psychiatric conditions. Serotonin Receptor (5HTC). This is a specific serotonin receptor that is associated with an increased risk of weight gain from atypical antipsychotics like olanzapine (Zyprexa). Dopamine Receptor (DRD2). This dopamine receptor is associated with response to atypical antipsychotics. Catechol O Methyl Transferase. This gene is associated with the level of dopamine present in the prefrontal cortex. In turn this can be associated with reductions in attention or focus. Methlene Tetrahydrofolate Reductase. Some people have a form of this gene that makes it hard for them to get needed folate (an essential B vitamin) into their brain and therefore may indicate the need for supplementation with L-methylfolate. Several Cytochrome P450 enzymes. The cytochrome P450 system metabolizes, or eliminates from the body, most medications. 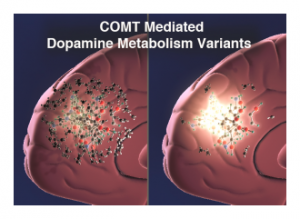 Variants can be associated with more rapid metabolism (needing higher doses than usual) or slow metabolism (needing lower than usual doses).